Test items: In the test of new washing machine, voltage, current, power, and the control signal on the time control panel need to be recorded. 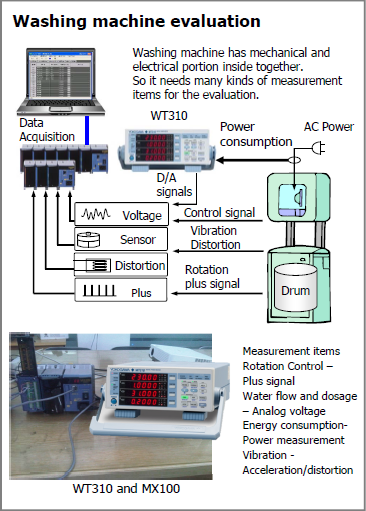 High sampling rate of data acquisition to record the motor controlling signal. Measurement of high voltage and the power changes at the time of motor startup. Solutions: The oscilloscope only has a few test channels and ordinary data acquisition unit can't acquire high voltage signals. Use the combination of WT310E + MX100 to fulfill the function. MX100 uses high-speed channel modules to record the controlling signal at sampling rate of 10ms. WT310E is used to record the power at motor startup. The high-voltage signal and power signal are converted to low-voltage signals through the D/A output, which are then recorded by MX100. The D/A output of WT310E enables analog output of the power signal, making it possible to record power waveform by data acquisition device. The high-speed channel of MX100 realizes recording of high-speed controlling signals, and can withstand high voltage during live line measurement.